... Who Would You Go Bald For? My sister-in-law, Sara, (on the left) became bald as a result of her treatment for cancer. (She is doing well.) My wife and I (next to her) chose to be bald as a result of clippers when we visited her recently. Sara has surprised to see our lifestyle choice. We spent a long relaxing weekend in the Toronto area being bald with her. When we left she gave me a hug and said, "Thanks for going bald for me." My favorite name for Jesus Christ is Emmanuel for it means "God with us". I thank God that Christ gave up so much to be with us in our earthly struggle. Hope you choose to be with others as God chose to be with you in Jesus Christ. God our Help, bless those who help others, who extend the hearts and hands to others lifting strangers out of danger. Enhance their efforts, focus their training, multiply their preparation so that they can quickly, efficiently, and safely bring sustenance to the hungry, shelter to the exposed, and warmth to the cold. God our Sustainer, bless those who stay the next day, who lay a foundation on which recovery depends. May they be strengthen to continue when others leave. May they be heard when the crisis is past as they move people and places from rescue to renewal. God our First and Final Hope, bless those who look with resolve at how next time will be a better time, who prepare people and resources to move out of Chaos into Hope. May their planning be blessed with insight, may they find support in their efforts to do good better, and after doing all they can, may they rest easy at night knowing that we are finally safe in your preparations which is our sure hope. Amen. Why have you come to our planet? Yes, this is our planet. Hmm...You might expect something more illuminating from the representative of an advanced civilization than an "Is" / "Is Not" exchange. But it is direct: we do not own the planet. Christians and the religious have known this without help from aliens. Our job description in creation is to care for the God's earth, not consume it. Even our title to the land is temporary, we are caretakers of God's garden and hold it in trust not only for those who follow us, but for those who follow Him. May you stand still today and enjoy the part of God's earth entrusted to you. In the day that the Lord God made the earth and the heavens, 5when no plant of the field was yet in the earth and no herb of the field had yet sprung up-for the Lord God had not caused it to rain upon the earth, and there was no one to till the ground; 6but a stream would rise from the earth, and water the whole face of the ground- then the Lord God formed man from the dust of the ground,formed a man (Heb adam) of dust from the ground (Heb adamah) and breathed into his nostrils the breath of life; and the man became a living being. And the Lord God planted a garden in Eden, in the east; and there he put the man whom he had formed. 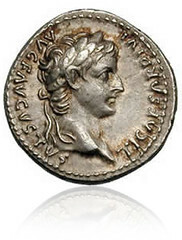 When Jesus was asked about taxes he pointed out that the coins have Caesar's image on them, so they belong to Caesar and should be given back to him if he wanted them. A rather profound teaching about how our participation in systems have unintended consequences. One cannot separate the coin from the purposes of the creator. The rest of the story is remembering that according to Genesis, we, humans, are created in the image of God. We are God's coin in the world. I hope you spend April 15th well. If It Is Missing...It's Important! There is a thumbnail sized plastic part missing in my microwave. It is the part that makes the serving dish rotate while the food is being zapped. Without that little piece of plastic, the whole microwave doesn't work right. Even though the motor is rotating the axle properly and the microwave are raining down as they should, without the little part; the platter is motionless and one part of the food is burned while another is left nearly frozen. Blacken iced egg-rolls anyone? We encourage all church members to find a ministry, something to contribute to the greater good. Even if it is a small part, it may be what makes the everything work together for good. I hope you do a good turn today. But God has so arranged the body, giving the greater honour to the inferior member, that there may be no dissension within the body, but the members may have the same care for one another. If one member suffers, all suffer together with it; if one member is honoured, all rejoice together with it.